I picked this up from a stack of my nephew's books. His dad said they hadn't read it because it was too old for him. 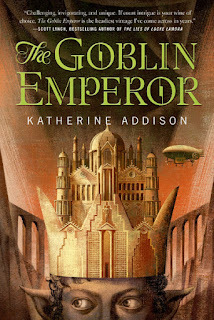 I don't know what prompted me to pick it up, but I am glad I did, because it is the best fantasy book I've read in a while and probably one of the most enjoyable books I've read of any genre in the last decade or so. It's the story of an exiled orphan, who is yanked from his role as bullied supplicant to the capital city where he learns that he had become the emperor. The story is about him going from fearful, inexperience naif to someone who could actually manage the role of leader of an empire. There are dangers and challenges everywhere and the book is a super satisfying study of someone slowly finding confidence and opening his innate abilities to succeed and even do some good in the world. I'm not doing a good job of selling this to you, but if you like courtly intrigue, diplomacy and battles of wit in a cool fantasy setting, you should check this book out.